AND A NEW THREAT THAT WILL BRING HUMANITY TO THE EDGE OF EXTINCTION. The dust from Dr. Kate Lovato’s bioweapon has settled. Projections put death counts in the billions. Her weapon was supposed to be the endgame, but it turned a small percentage of those infected with the Hemorrhage Virus into something even worse. With the doomsday clock ticking, the fractured military plans Operation Liberty—a desperate mission designed to take back the cities and destroy the Variant threat. Master Sergeant Reed Beckham agrees to lead a strike team into New York City, but first he must return to Fort Bragg to search for the only family he has left. 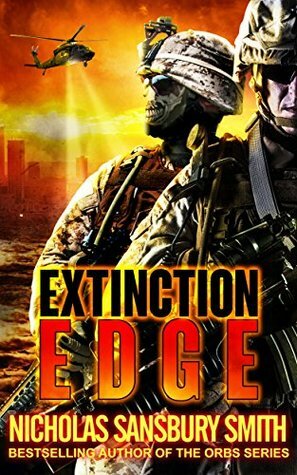 This is an excellent sequel to Extinction Horizon. It picks up the action in the closing stages of Extinction Horizon, but from a different POV within NYC. Smith expands the scope of the story nicely with this book. New characters are introduced, two of which quickly became my favourites among the new crop, and we see the threat from the Variants ramp up quite a few notches through the course of the book. It was good that, while there was a lot of bad news, some hope and good news is sprinkled through the story, allowing the reader to take a break. In some senses, this book immerses one more into the utter devastation wreaked, and the threat level posed by the Variants, and I had to agree with this sentiment: “Beckham missed the days of fighting enemies that moved on two legs.” There were times while reading that I struggled to reconcile my daily life to what was in the pages of this book. Well done! 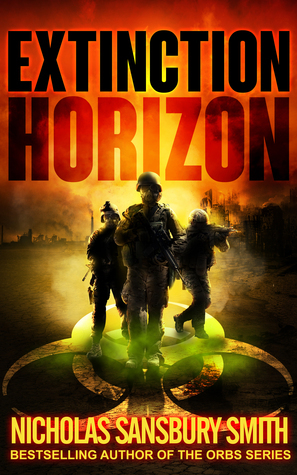 A relentless, unflinching post-apocalyptic vision, Extinction Horizon is a terrifying what-if scenario of the consequences of scientists experimenting with bio-weapons. The story primarily follows a team of Delta Force Operators, led by Master-Sergeant Reed Beckham, as they struggle to carry out orders amid the growing chaos of a fast-spreading viral outbreak. In tandem, we get to know Dr Kate Lovato, a scientist with the CDC, who is fighting to find a cure for Ebola, but ends up struggling to find one for the bio-weapon-Ebola hybrid they name the Hemorrhage Virus. The Hemorrhage Virus is truly terrifying; it literally transforms people into hemorrhaging, violent, cannibalistic monsters. The bio-weapon latches onto the highly-contagious Ebola virus, with the result that the spread is extremely rapid. The Delta Force Operators spend several stretches of the book in direct combat with the monsters (once human, but little humanity remains after the transformation), making for a gripping read. The characters in this book were, for me, totally believable. Well-rounded, they each had fears and aspirations, and the events that unfold test them all to their limits. The events themselves – not that far-fetched – and the science is plausible and well-researched. While the story is unquestionably gruesome, I did not feel that this aspect was overdone, or gratuitous; there was a logical explanation within the context of the story that accounted for the horrifying images and actions. Colonel Gibson, the architect of the VX-99 bio-weapon and the resulting hybrid Hemorrhage Virus, cuts a sympathetic figure in this story. While his decisions have awful consequences, one can understand his motives. It was a relief that he acknowledged his guilt and complicity in the outcome, even before being challenged. I thought this book was very well written. In selecting the Ebola virus as the main vehicle around which the story revolves, Extinction Horizon is very topical and, consequently, accessible. Smith, whose writing is consistent with his more recent novels, holds nothing back in depicting the horror of the situation the characters face, and draws the reader into the action with skill. I found it very easy to visualise the events as they unfolded. This is an excellent book, and I have already recommended it to several friends. It is best suited to readers who like a good post-apocalyptic bio-medical thriller, and don’t mind a gruesome tale.